This long-awaited update of the classic, The Human Nervous System, stands as an impressive survey of our knowledge of the brain, spinal cord, and peripheral nervous system. The book has been completely redone and brought up-to-date. An impressive and respected cast of international authors have contributed 37 chapters on topics ranging from Brain Evolution, all phases of Brain Development, to all areas of the adult brain and peripheral pathways, along with careful descriptions of the spinal cord and peripheral nervous system, brainstem and cerebellum. The Human Nervous System, Second Edition will again serve as the gold standard, providing a one-stop source of up-to-date information about our knowledge of the human nervous system. 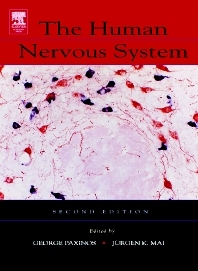 This second edition of the standard reference on the human nervous system is extensively and completely revised and updated from the 1990 first edition. Written by the leading researchers, many chapters have been completely rewritten, new chapters have been added. A new section on Evolution and Development provides a broader perspective, and all chapters include references and perspectives to neurological disease.